Small business owners tend to discount the need for doing detailed bookkeeping throughout the year. Instead, many scramble come April 1st trying to pull together a full year of bookkeeping in just two short weeks. That’s way too stressful—and quite honestly, completely avoidable. Especially if you are a virtual assistant and profess to clients to be efficient and a time saver—take your own advice on this one! Your accountant will not only sing your praises when you walk in with your books all organized, but you’ll have a sense of accomplishment all year long knowing that you are on top of your business finances. We recommend tracking all of your business accounting transactions in an accounting program, such as Quickbooks. You can do all of your invoicing to clients, accounts payable, accounts receivable, and check writing while keeping a pulse on your financial situation throughout the year. 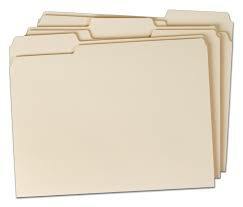 Grab 12 manila folders. Create a folder for each month of the year. Group the individual folders by quarter and place those three monthly folders into a single hanging folder. Now begin to gather all your monthly bookkeeping activities into the monthly folder—deposit slips, paid invoices, copies of customer invoices if you print those out, receipts, payroll, tax payments, etc. Everything you process through your accounting package ought to be placed in the folder once complete. It’s good practice to reconcile your bank account and any credit card accounts every month. Using an accounting program allows you to do this with ease by importing all transactions and assigning them to income and expense accounts. Once all transactions are assigned you can then reconcile the account to keep your books in balance. At the beginning of each year start a log (consider a binder you can build over time, or an Excel spreadsheet) of all major purchases, including item description, use in business, date purchased, what you paid, and any model or serial numbers. By doing this as you go you accomplish multiple things – an accurate accounting of these items for your tax preparer; an insurance record should you ever have the need to claim a loss; for software or other user licenses you have the information without having to track down boxes or emails. You can even take pictures of the item and its serial number to keep an electronic accounting of for insurance purposes. This is a tough one, and the IRS knows it. They get tougher every year on those who claim personal vehicles for business use and vice versa. Keep a log in your car or on your smart phone (we’re sure there’s an app for it!). Start by logging your mileage on January 1 and then each time you get behind the wheel for business purposes capture beginning and ending mileage as well as the purpose of the mileage. Having an accurate accounting of this on file throughout the year will prove beneficial come tax time. If you work with contractors and other 1099 vendors, make it a requirement of their first assignment or at contract signing to provide you with a signed W-9 form. Upon receipt, fax it to your accountant and set them up as a 1099 contractor in your accounting package. Come January 1 you can run a quick report of all 1099 contractors and amounts paid. Hand that over to your accountant for generating 1099s as early as possible in January—not only will your accountant love you, so will your contractors. Following these steps will not only make you feel more confident when you go to file your taxes next year, you’ll feel more confident and organized in your business overall—all year long!